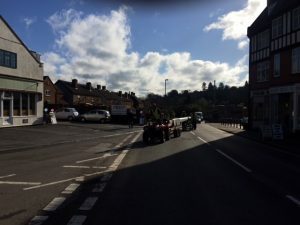 Nikki Barton – Independent candidate for Surrey County Council (Haslemere Ward) and Haslemere Town Council (Haslemere South Ward) – 2 May 2019 local elections. Serving community interests and not political interests. Haslemere first. Do you have 20 minutes spare today? 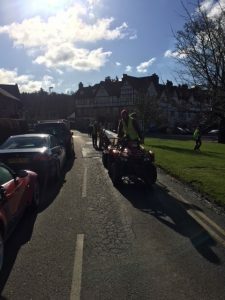 This entry was posted in Haslemere first and tagged Haslemere Community Rail Partnership, HaslemereToday, Volunteers on March 26, 2019 by admin. 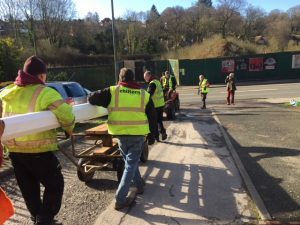 Here are some pictures of the Haslemere volunteers who helped move the new flagpole from JE Homewood‘s yard to St. Christopher’s Church yesterday. This is part of the Haslemere Great War Centenary Memorial. (More here, here and here.) 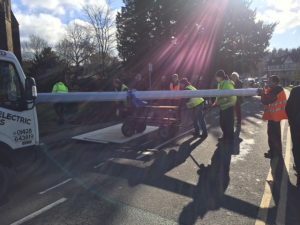 Thanks to patient drivers on Wey Hill who waited as the flagpole was moved). 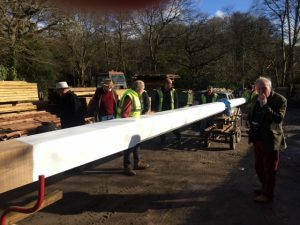 The flagpole is being raised by crane to the top of the Church Tower next Tuesday, 17th April, from 10:00 am. 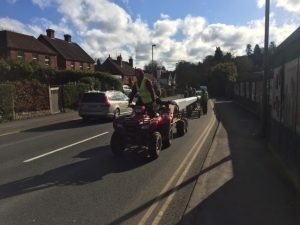 This entry was posted in Haslemere first and tagged Haslemere, Haslemere War Memorial, HaslemereToday, HaslemereTomorrow, HaslemereYesterday, Volunteers on April 6, 2018 by admin. 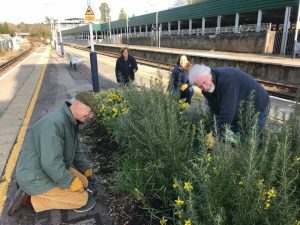 In Haslemere today, some of the lovely volunteers who, as part of the Haslemere Community Rail Partnership team, helped clear the station’s flower beds on the platform. The daffodils are now looking gorgeous. What a great improvement! Lovely to see the sun and blue sky too after the snow. 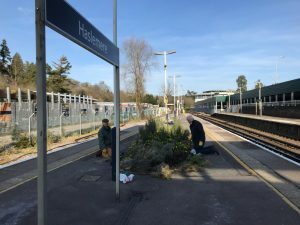 This entry was posted in Haslemere first and tagged Haslemere, Haslemere Community Rail Partnership, HaslemereToday, Volunteers on March 21, 2018 by admin. 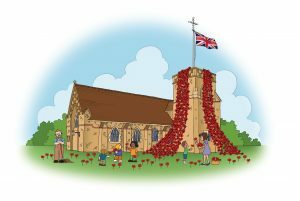 Please note that tomorrow Friday 16th March, will be the last day of poppy pinning as the two nets for St Christopher’s are complete. However, there are still poppies to use for decoration, so we fully intend to continue preparing the remaining poppies for other nets and we will announce when we start doing this in due course, but we have decided to have a breather for the time being and take stock. A huge thank you to all the volunteers who contributed to completing the task in about half the time we expected. Many volunteers have taken boxes of poppies home with them to prepare them for pinning with drilling and threading. Many of the poppies have been stiffened up with backing material in order to brave the elements more readily. On the 24th March (Saturday week) between 10.00 am and 1 pm we will be starting the next part of the project, sowing the poppy seeds into trays and distibuting them around the community for nurturing in various greenhouses around Haslemere. The sowing will take place at St Christopher’s and on St Christopher’s Green – weather permitting. Volunteers all welcome. 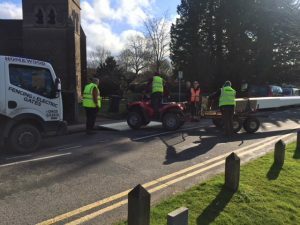 This entry was posted in Haslemere first and tagged Haslemere, Haslemere War Memorial, HaslemereToday, Poppies, St Christopher's Chrch, Volunteers on March 15, 2018 by admin. 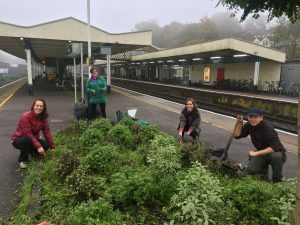 Big thanks to the community volunteers who helped this morning clearing the bedding on the platforms at Haslemere station. We’ve more to do and will send a call-out after half term. And, a picture of the community volunteers. Thanks! 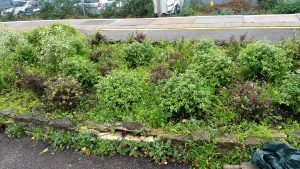 This entry was posted in Haslemere first and tagged Haslemere, Haslemere Community Rail Partnership, HaslemereToday, Volunteers on October 19, 2017 by admin. ACoRP – the Association of Community Rail Partnerships – is the membership body for almost 50 community rail partnerships, representing over 80 community rail lines across the UK, as well as more than 1,000 station adoption groups. The Haslemere Community Rail Partnership was established in October 2015 with the purpose of promoting Haslemere and its surrounding countryside, to promote rail travel to the town as a more sustainable travel mode and to improve the station and forecourt environment. 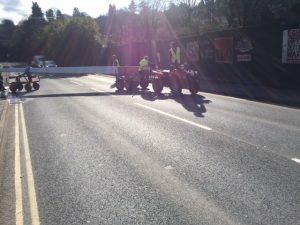 You can read more about it here in this town council document and here in a past update on this blog. 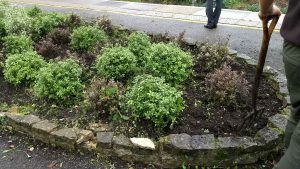 In Haslemere today, I spent a few hours weeding and tidying the flower beds on the platform. There is more work to be done! If you are free for an hour or two on Thursday morning from 9am, please do come along with gardening gloves for some gentle weeding. I’ll bring a flask of tea for us to share. 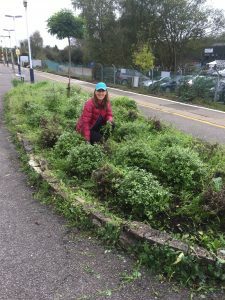 This entry was posted in Haslemere first and tagged ACoRP, Haslemere, Haslemere Community Rail Partnership, HaslemereToday, Volunteers on October 17, 2017 by admin.